Mesmerized is about hypnosis and the discovery of the placebo effect, the development of the 'blind testing' method still used in science today. 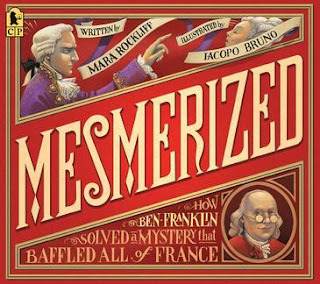 Until I read Mesmerized I didn't know that Benjamin Franklin had travelled to France in 1776 to ask for help in the American Revolution. The French people knew of Benjamin Franklin because of his famous experiment flying a kite during a thunderstorm to prove that lightening was electricity. While Franklin was in France, a Dr Mesmer made a name for himself, being able to wield a strange kind of power over people. Dr Mesmer could wave his wand and control - mesmerise, or hypnotise - them. But he couldn't mesmerise Benjamin Franklin, who thought it was all in people's minds. Franklin set about uncovering Dr Mesmer's secret by blindfolding people and testing them in different ways. Using his scientific approach, Bejamin Franklin was able to explain how Dr Mesmer had mesmerized people. King Louis XVI was so impressed that he provided French support for the American Revolution! Mesmerized tells its story in a narrative style, using a fabulous design with different typefaces and sizes, diagrams, illustrations, and language to evoke the cultural experience and emotion of the times. Boxes labelled 'The Scientific Method' are provided to highlight how a scientific experiment works: asking a question about something you've observed, hypothesising, testing a hypothesis, and using the results of the tests to draw a conclusion. Packed with detail, Mesmerized makes science and science history accessible. It's a thoroughly entertaining and educational book.